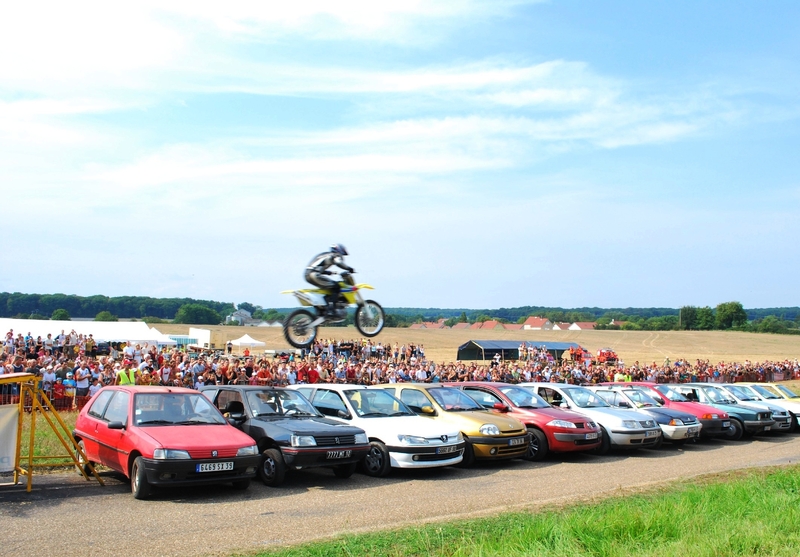 This stunt was done at the requirement of the Coni’fer festive day organizers (the tourist railway in Haut-Doubs). We offered them a big jump over their incoming train on the festival place. Press article from “Moto et Motards” : “The sky is the limit”. Bourny X-treme Machines is a stunt show famous in the stunt shows world. If you never heard of it, for sure your life is not extreme enough. Anyway, Cyril Bourny just achieved a rather crazy performance : jumping over a moving railway locomotive. A 45 meters (49 yards) long and 6.5 meters (6.56 yards) high jump. Despite the wind, Cyril held on and did his stunt. He finally landed a bit far and ended his run in the security straw balls. Yet it did not prevent him to achieve his performance. A new world first for this talented stuntman ! The motocross first big jumps were performed by Patrick Bourny as soon as he started in 1978. As for example over 12 busses, 10 semi-trailers, a 35 meters (38 yards) blaze or the Rhône-Rhine canal. By combining his experience in free style, motocross, enduro and supermoto, Cyril Bourny worked out the jumps performed by our pilots. Patrick was the first to start the world records with a motocross wheeling at 147 km/h (91 mph) with his Yamaha 490 YZ on the Carole circuit in 1982. After being in competition for this title with pilots such as Laurent Aubujeau, Alain Brochery, Gilles Husson et Richard Almet, he worked out in 1984 the first truck in the world to drive balanced on its rear wheels. Jumping through fire rings, hitting a fire wall with a motorcycle or a car, human flame torch, any kind of vehicle exploding… can be performed during the shows. For the record, the very first fire wall was made of whole straw balls, soaked with gasoline, at the end of a launching pad. Trying to drive through, the motorcycle remained stuck inside and, as far as the biker was concerned, he went on flying through the air. After several other burns, falls, faulty trajectories, the technique was much improved. In 1985, the “Pôle Nord” manufacture asked for Patrick Bourny to test its new leather suit. In order to try its resistance to wear, he got dragged over 200 m (219 yards) at 80 km/h (50 mph) by a motorcycle during the Bol d’Or on the Paul Ricard Circuit. Patrick turned it into a stunt in 1993, for the show “Les Marches de la Gloire” with Laurent Cabrol as presenter on TF1 TV channel, where Jean-Paul Henri, a stuntman from Team Bourny, got dragged behind a buggy at 120 km/h (76 mph). In 2012, Cyril renewed this stunt by dragging Barracuda with his 900 Hornet at over 150 km/h (93 mph) on Le Mans 24 Hours Circuit. This show was first introduced on Le Mans Circuit during the Truck 24 Hours. Stuntman David Bionda gets dragged on metal soles behind a motorbike at over 120 km/h (76 mph), then he lets go to end his run skidding. Minimum track : length 120 m x width 3 m.
Surfacing : preferably on tar. Also possible on pit run, dirt track or grass. Duration : 2 possibilities : 1 pilot 1h15 – 2 pilots 1h30.